Vinayaka or Ganesha Chaturthi is the Hindu festival celebrated on the birthday (rebirth) of Lord Ganesha, the son of Shiva and Parvati. He is worshiped as the Lord of beginnings and as the Lord of obstacles, the patron of arts and sciences, and the God of intellect and wisdom. This year Ganesha Chaturthi falls on Monday, the 9th of September. May Lord Ganesh bless you with Devotion, Knowledge and Prosperity. There is a story behind the symbolic snake, rat and the singular tusk. During one of the birthdays of Ganesha, His mother, Parvati, cooked for him twenty-one types of delicious food and a lot of sweet porridge. Ganesha ate so much that even his big belly could not contain it. Mounting his little mouse, he embarked on his nightly rounds. His mouse suddenly stumbled upon seeing a huge snake. To adjust His belly, Ganesha put the snake on as a belt around his stomach. All of a sudden, he heard laughter emanating form the sky. Ganesha and His brother Lord Subramanya (Kartikya) once had a dispute as to who was the elder of the two. The matter was referred to Lord Shiva for final decision. Shiva decided that whoever would make a tour of the whole world and come back first to the starting point had the right to be the elder. Subramanya flew off at once on his vehicle, the peacock, to make a circuit of the world. 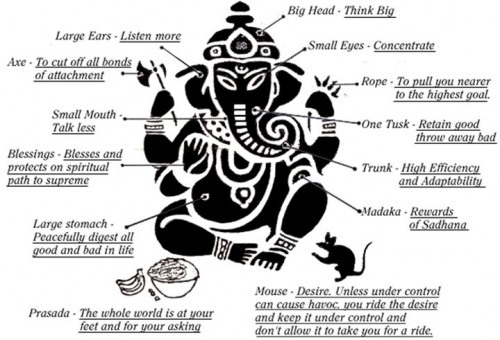 But the wise Ganesha went, in loving worshipfulness, around His divine parents and asked for the prize of His victory. Lord Shiva said, "Beloved and wise Ganesha! But how can I give you the prize; you did not go around the world?" Ganesha replied, "No, but I have gone around my parents. My parents represent the entire manifested universe!" Thus the dispute was settled in favour of Lord Ganesha, who was thereafter acknowledged as the elder of the two brothers. Mother Parvati also gave Him a fruit as a prize for this victory.